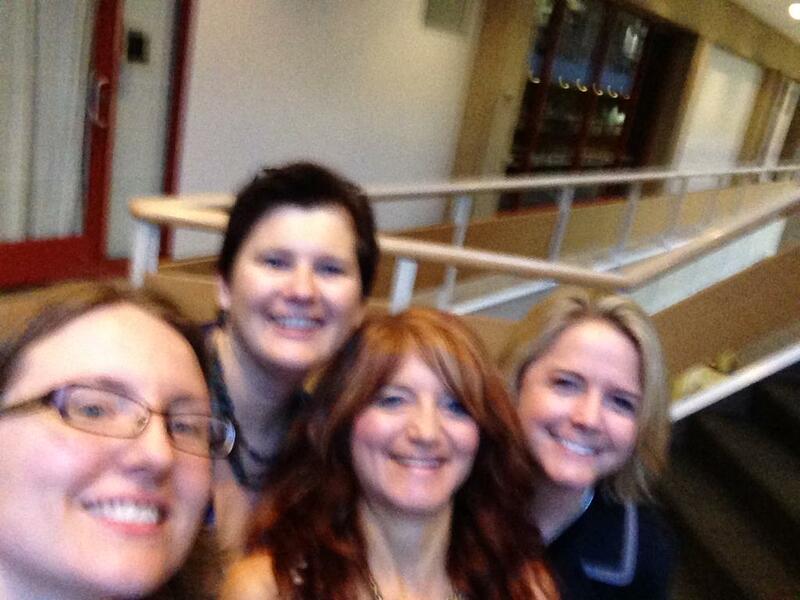 During #dLRN15 mothers, fathers and daughters was a theme for me-although my amazing daughters were not with me. Catherine Cronin, Kate Bowles, Bonnie Stewart & Dave Cormier, Whitney Kilgore (brought her daughter virtually via Facetime) and Andy Saltarelli all gave their daughters an amazing gift by bringing them to the conference. These daughters were surrounded by role models, and had experiences that I expect will change the narrative of their lives. In my previous job my youngest daughter Rosie traveled to Panama with me five times before she left elementary school. While there she attended college classes taught by the other faculty and (mine were too “boring”) participated in class discussions and activities with the students. Each of the students in my classes, and the faculty with whom I taught, became a part of my daughter’s story-they shaped her narrative.To this day, things she learned in those classes have had a lasting impact on the woman she has become. My older daughter Anjelica traveled with me to Panama as well. Her experiences there witnessing the extreme gap between wealth and poverty had a lasting impact on her story. She is currently a Biomedical engineering major hoping to someday bring medical care to developing countries. Throughout their childhood, girls develop beliefs about their abilities, what it takes to complete particular tasks, and what the possible “outcomes” for them are. Their perceptions of what they can achieve are significantly impacted by social interactions with peers and adults. It is through these interactions girls learn about gender roles, stereo-types, and what others expect of them. As girls grow up it is these vicarious experiences that influence the choices they make and ultimately the story they tell. Privilege has given our daughters opportunities many don’t have. From the time before our daughters are born we begin to shape the narrative of our daughter’s lives. What happens to those girls who don’t have mothers and fathers to provide them with the role models, experiences and words of encouragement needed to build their efficacy and shape their goals and dreams? How can the digitization of education provide access to role models and experiences for girls across the globe and socio-economic levels? What can we do to change the ending of the story? Today I am presenting at an AAUW conference on engaging girls in STEM. This presentation will build on one Whitney and I did at #OLC15 with a goal of gaining a better understanding of how we can use digital content such as MOOCs to create on ramps for girls into STEM. At #et4online Whitney Kilgore and I connected with a common interest in MOOCs and engaging women in STEM. This led to Google Docs, every other Saturday morning Hangouts, and eventually a Human Centered Design Thinking (HCDT) MOOC. We began our journey thinking we knew what the problem was. Lots of people were creating STEM MOOCs with the idea of engaging girls in STEM. We wanted to go one step beyond and create a MOOC that would enable girls to make connections with women in the field and gain an understanding of all the opportunities a STEM degree can provide. We wanted to develop a learning community that would live beyond the MOOC. Through conversations with others this idea grew into a need for k-12 professional development that aligns with NGSS (Next Generation Science Standards) and a specific focus on CS (computer science) and engineering. In realizing that a high percentage of MOOC enrollees are teachers we thought, why not design a MOOC specifically for teachers. Again, we thought we knew what the problem was. As we began to speak with teachers and people doing research in this area we quickly realized we were designing a solution for the wrong problem. We didn’t really understand our users. How do they experience professional development? What are the barriers and challenges they face? How do we gain an understanding of what teachers want, need and desire? What is their story? Our work in the HCDT MOOC helped us find our way to answering these questions. We recruited a few other participants on our team and began digging in. We brought this work to #OLC15 and a group of 16 eager participants. We arrived with interview questions we developed in the MOOC and our “speed design thinking” templates. Little time was spent with us talking and power points. This was about facilitating a discussion and gaining a deeper understanding of what the problem is and ideating possible solutions. It was about gaining empathy and hearing their story. There were deep discussions, sticky notes and in the end exchanging of business cards and plans to bring this back to their offices, classrooms and universities. How many times have we heard a teacher say, “professional development is a waste of our time”, “they don’t really understand what we need or the problems we are facing”. We would like to do more than just hear what you are saying, we would like to listen to your story and think thoughtfully and intentionally about a solution. Over the last 6 months we’ve taken apart and deconstructed our understanding as we had known it to build a new understanding together. We are still in the “understanding” phase. How might we create professional development that is replicable and scalable around helping girls develop a STEM identity? I was reflecting back on the anticipation I felt as I headed to #ET4online. Relationships were developed before the conference via Twitter, Google Hangouts and Google Docs as we planned a panel from across the country and across the globe. The conference itself had deep conversations, crayons, and a vulnerability you don’t often see at a conference. Today as I head to #OLC15 and #Dlrn15 the bar is high and I am confident it will be met. Already I’ve had some incredible, deep conversations with #Dlrn15 attendees in Slack. We are building relationships and gaining empathy for one another in a way that you don’t often see face to face at a conference, let alone via social media. Slack was a new tool for me, and like many I joked, “should I post this in Slack, Twitter or Yammer”? “How does this thing work anyway?” Initially it was unclear what it’s purpose was or why we were using it for the conference. It quickly became clear and soon I became a Slackaddict. I’m not yet sure if it is the tool, the people, or the content. I imagine it is a “perfect storm”. It’s made me think of how we teach our courses and the discussions we have about community, engagement and interaction. The discussion in Slack is engaging because it is meaningful to us and we are driving the content. While there is a general topic, there is no specific discussion question or learning objectives that constrict our journey. We’ve been given a space to explore something where there is no known answer. The answer can’t be found in the back of a text book or in a Google. search The tools we have are our current knowledge, our experiences, and a safe space to share, reflect, build and rebuild our knowledge together. Isn’t that the learning experience we want for our students?